Definition: A Wage is a monetary compensation given by the employer to the employee (labor) for the amount of work done on an hourly, weekly or monthly basis. Minimum Wage Method: Under this method, the minimum amount of wage is paid to the employee irrespective of the employer’s paying ability. It is based on the concept that the wage is paid not for the bare sustenance of life, but for the preservation of the efficiency of the worker. Thus, the minimum wage must provide for education, medical requirements, and other essential amenities. 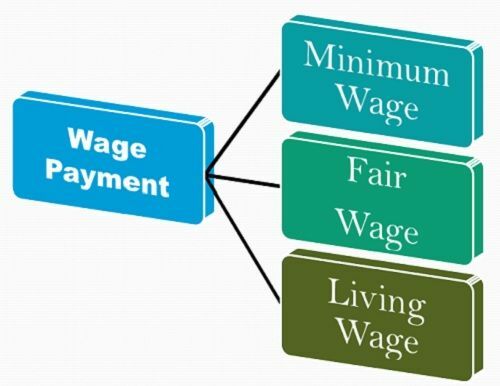 Fair Wage Method: The wage is said to be a fair wage when its amount is similar to the rate that prevails in the same industry in the neighborhood or the rate that prevails throughout the country for the same kind of work. A standard rate is maintained for the wage that prevails in the other similar industries, and this rate is determined by the companies where exists an unionized labor and is in large numbers. Living Wage Method: The living wage is slightly higher than the fair wage, in which the worker not only fulfill his basic needs of life viz. food, clothing and shelter, but also avail the frugal comforts such as education of children, insurance, protection against ill health, essential social needs, etc. The rate of the living wage is determined on the basis of economic condition prevailing in the country.Therefore, these wage rates may differ from country to country. Thus, the employers follow different methods of wage payment depending on their paying capacity and the economic conditions prevailing in the country.